This home is located in paris. The property has 2 bedroom(s) and 2 bathrooms. A splendid apartment with decent elevator suitable for two couples or a two adults and two children. 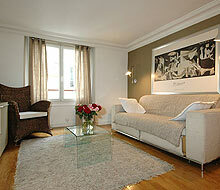 Very well located within an easy walk from three metro stops and Notre Dame. Excellent support from staff. Good instructions for use in the apt. (Microwave, oven, dishwasher and washing machine). Highly recommend. 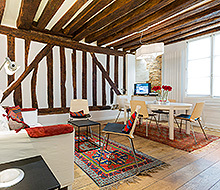 The apartment was beautifully located and appointed. Unfortunately we did not have hot water or heating for 40% of our stay. Your representative was very obliging and attentive (and apologetic) but there was a significant lack of amenity associated with no heating in cold December, 2018. If we had not had the heating failure, it would have been perfect. We had an excellent stay at the apartment in August 2018. The apartment is spacious, well-appointed, and has a terrific location. The apartment contains a generous amount of common space, including a foyer, a large living room (complete with a fireplace that did not get much use during an August heat wave), and a kitchen and dining room. Televisions were available in the living room and bedrooms, but who goes to Paris to watch TV? From the apartment’s wall of windows, which provide wonderful light, one can look to the left and see Montparnasse or to the right to see the plaza in front of Notre Dame, a mere block away. The apartment overlooks the Square René Viviani and a small park. Above the rooftops, the tip of the Eiffel Tower is in view (best seen at night when the tower is lit). We didn’t go to Paris to cook for ourselves, but we did appreciate having a full kitchen that was stocked with plenty of dishes and glassware (if you invite friends over, you will have plenty of champagne glasses! ), as well as a coffee maker and a microwave. For two couples traveling together, having two bedrooms on opposite ends of the apartment, each with large windows, was ideal. Having two bathrooms (one with both a shower and a tub, and one with a multi-jet shower) was a wonderful luxury. The beds were comfortable, and both bedrooms had ample closet/storage space. We also appreciated the electrical converters available, which made it easy to keep multiple phones and tablets charged. The washer/dryer was a great convenience (although we found that most clothes had to be hung up to finish drying). Facing a fairly busy street, the apartment does get street noise, although the noise is (mostly) reduced at night. Because the apartment is not air-conditioned, opening the windows was essential to cool the apartment at night and that certainly increased the noise we heard. Overall, however, we did not find the noise to be a problem and we felt that the views more than compensated for any noise. We loved the location of the apartment more each day we were there. Several Métro stations are only a few minutes away (including RER lines that make it a breeze to get to the apartment if you are coming from or going to Charles de Gaulle airport or the Gare du Nord). Many cafés and restaurants are within a few blocks, including French, Chinese, Greek, and Lebanese cuisine. Several lovely bakeries are in the area, including Bertrand’s around the corner. One of the best cheese shops in Paris, Fromagerie Laurent Dubois, is worth the three minute walk (as is the wine shop and bakery next to it). Grocery stores and a pharmacy are a block away. For sightseeing, Notre Dame is down the street and the Hotel de Ville is five minutes away. The Marais and the Pompidou Center are a short walk across the river, and Boulevard Saint-Germain and the Sorbonne are close by. 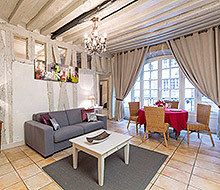 We selected the Notre Dame apartment after the apartment we booked in the Marais became unavailable. We have no regrets with the change in location and would have no hesitation in booking the apartment again.